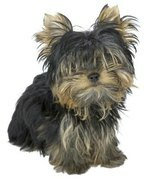 Yorkshire terriers are among the most popular toy dog breeds, but they don't make great playthings for children. That doesn't mean Yorkies and kids can't mix, just that Yorkies aren't great "kids' dogs." If you have a Yorkie and kids, you must teach the kids the right way to interact with the small terrier, and you must reprimand the Yorkie in appropriate ways if she snaps or growls at children. According to the American Kennel Club breed standard, Yorkshire terriers shouldn't weigh more than 7 pounds at maturity; many weigh as little as 4 pounds. The small size and relative fragility of these dogs makes them poor pairings for families with young children. Toddlers and preschool-age children can unintentionally harm a tiny Yorkie quite easily -- and a frightened dog defends herself in the only way she knows how: with her teeth. Yorkies don't have the sweetest temperaments, made evident when they feel threatened. Besides defensive nipping when scared, a Yorkie might even start offensive nipping when rambunctious kids approach. Yorkies are terriers, which means their frou-frou appearance belies a tough little dog. They aren't afraid to take on bigger dogs when out for walks or at the dog park, and annoying kids can fall into that same category. While Yorkies aren't suitable for families with young children, older kids are another story. Once children are old enough to understand how to approach and handle a small dog, they can bond with a Yorkie. Since Yorkies are often quite playful, they can make good companions for older kids who know better than to roughhouse with a tiny canine. Yorkies require extensive grooming, which offers one way for kids to learn to care for these dogs. If you're looking for a small breed that works well as a family dog, there are far better choices than the Yorkie. These include the good-natured Cavalier King Charles spaniel, the friendly Shih Tzu, the very smart and alert miniature schnauzer, the happy, kid-loving beagle and the low-maintenance French bulldog. Yorkies are considered by some owners to be hypoallergenic, although there's no such thing as a truly hypoallergenic dog. If allergies are an issue, consider common poodle mixes such as the schnoodle, which is a schnauzer and poodle mix), the cockapoo, a cocker spaniel and poodle mix, and the Yorkipoo -- no explanation necessary.